It was an awesome, bright & sunny day in Clearwater Beach. Kathy C (a Tampa skater) attended the skate/bike for the first time. Welcome Kathy! Bruce & Dorey Anne were absent because they are biking Europe. I had the honor to lead a group of 21, 7 skaters and 14 bikers for this Sunday Skate & Bike. The added responsibility made me forget my cameras, but Dee saved the day by allowing me to use his. Thank you Dee! Attendees: Amy, Carol, Chris, Dee, Dimitry, Glenn, Gustavo, Jeff, Joe, Karen, Kathy, Laura, Mary Beth, Michael, Nancy, Peggy, Ron, Sandy, Steve, Theresa and the Breeze. Thank you all for coming. Gustavo's Garmin recorded 11.18 miles (18.99 kilometers). Some people went up to the bridge for an extra workout. We brunched at Georgie Boy Restaurant on 1101 S Missouri Ave, Clearwater. Went there with no reservation, but they seated us right away, gave us a long table for 20. The service and food were excellent. Most people agreed on a 9.5 rating. 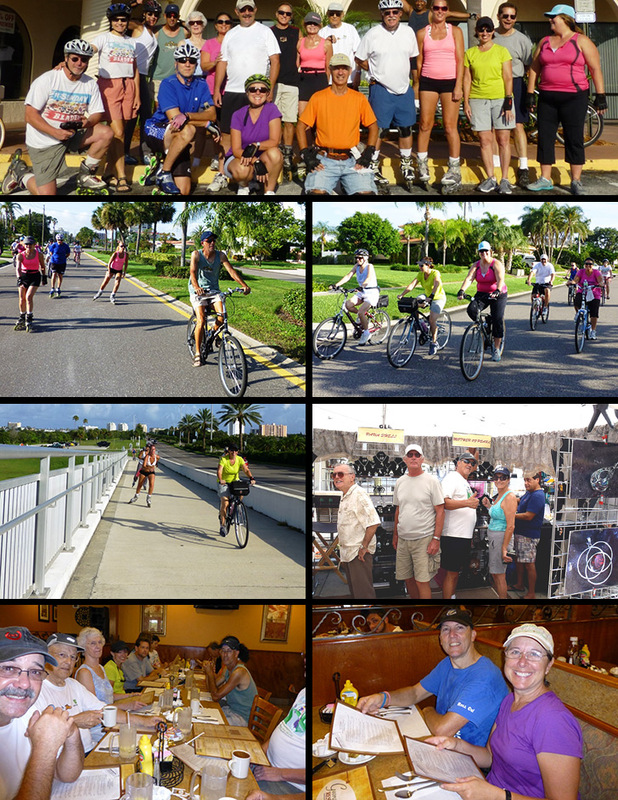 Next Sunday Blade & Brunch is July 28 at 8:30 AM Upper Tampa Bay Trail. If anyone needs a ride, let Gustavo know, and we'll arrange for transportation to and from.